Congratulations to our very own Blythe Cricket Club for a cracking start to their season. The Cresswell-based team were promoted to the NSCCL Premiership for the first time last season, and some thought they may be destined to head straight back down again. But, not so! The lads had a 100% record until meeting this season’s leaders Porthill Park but even now still figure in the top five of the table. One wise new signing was Jalat Khan. Although we are not long into the season, the Pakistani international leads the batting and bowling stats! What with the consistently expert bowling of ‘veteran’ Matt Goodwin and the leadership of captain Peter Finch, all looks set for the club to have a good summer. However a real test comes up on 23rd June, when Blythe is at home to reigning champions Meakins. Entrance to matches is free. (By the way, if you are wondering where the young wicket-keeping star Jack Hammond has gone, well, it’s not far – he transferred to Checkley). The end-of-the-financial-year summaries have just been published for the county council’s ‘Community Fund’. Under this scheme, every county councillor is given a sum of money to distribute to projects in his or her own ward. Our own county councillor, Mark Deaville (his Cheadle & Checkley ward covers Draycott) nominated just over £7000 to thirteen local projects in 2017/18. In Draycott and Cresswell, his nominations saw £800 for Checkley Outdoor Bowls Club (which plays in Cresswell), another £800 for furniture for the new Blythe CC Community Pavilion (also in Cresswell), and £300 for curtains for the church hall. Click here to see details of all those grants. Mark is now making his nominations for 2018/19, so if you have a community project that you think could do with a few quid, just ask! Click here for details on how to do that. It’s interesting to see that our local newspaper The Stunner (aka The Cheadle & Blythe Bridge Times & Echo) is now available online as well as in paper form. So, if you prefer to keep up with the world on your computer (or phone), well, now you can. You can now get the whole of paper’s content, cover-to-cover, not just the headlines, by taking out an online subscription. What’s more, thanks to Lloyds Newsagents in Blythe Bridge, who still employ a paper girl, we don’t even have to leave home to read it, getting it delivered through the letterbox. Recent visitors to the Draycott Arms will have noticed that mine-hosts, Zara and Brayn (pic below), are looking even fitter and leaner than usual. This is because the pair are currently training for the 100-Mile Charity Cycle Ride – which takes place in July, raising money for the famous children’s hospital Great Ormond Street (aka GOSH). It’s a great cause too. Check out how to contribute by clicking the pair’s Just-Giving page. Alternatively, why not head on down to the Draycott Arms ‘Music in The Sun’ event this Sunday (10th), and make your contribution in person? For the first time, the fayre’s car-boot sale will be a stand-alone affair, taking place on the Saturday (the morning of July 7th). There is a large field to fill, so there is plenty of room. As it’s the first time of trying, the cost of a pitch has been kept deliberately low – just £5 per spot (including car). It’s free entry for the public. However, it is best to book your pitch in advance. Maureen Winfield is in charge of the organisation of it all – so email her if you want to make sure of taking part. Yes, the William Amory School website has been ‘hacked’: somehow or other a very clever internet-nerd has figured out all the passwords to the website and ‘broken into’ it; and replaced it with whatever she or he wants. People living in Cresswell might be forgiven for having a hollow laugh at the new words all over the homepage of Draycott Parish Council’s website. The fact is that Draycott Parish Council’s record on fighting the Blythe Park development has been rather weak. When trouble was happening in Draycott Old Road with the college earlier this year, the council summonsed the college authorities to public question-and-answer sessions, to explain what was going on – and not just once, but twice! Also, because there has been flooding of the ditches in Draycott Old Road, the council has asked the county councillor to make a special effort and draw up a special report about it. So… the council does manage to act sometimes, especially over issues in the Draycott side of the parish. But … when it comes to a huge problem in Cresswell (the Blythe Park housing development), what exactly has the council done during the last twenty months? Er…Written a few letters. And that’s it. By contrast, when housing issues (often much smaller than ours!) have arisen in other Moorlands parishes, the councils there have shown leadership. For example: in Leek East, a big demonstration (against The Mount housing plans) was organised; when they faced an unwanted development, Kingsley Council called an ‘extraordinary’ public meeting of locals; and Werrington Council organised a protest of residents outside Moorlands House. These parish councils have stood up and united their communities. The hundred-and-seventy Cresswell residents who signed letters opposing the Blythe Park application might feel just a little let down by their own community leaders on Draycott Parish Council; and a bit annoyed by the empty sentiments on the parish council’s homepage. A sad occasion last week was the funeral of Barry Phillips. After a working life at Blythe Colours, Barry became something of a local historian, doing massive amounts of research not only on Blythe Colours itself but on World War Two in this district, especially about the American ‘Bolero’ Camp in Cresswell, even going to America to meet former soldiers who had served here. He contributed his researches to the Draycott-en-le-Moors Online History website, the project which led directly to the definitive book about the parish ‘A History of The Parish of Draycott-en-le-Moors‘ by Matthew Pointon. Barry had lots and lots of stories about this area, and he will be sorely missed. We send our condolences to his wife Linda and his children, who are now grown-up. Draw a poster to keep us safe! Finally, it has been a great summer for activities in our little district. From the local dance-hall to the sports clubs to the churches and to the library and the pubs, everyone has tried to lay something on to make the summer of 2016 memorable. They all deserve a round of applause… And it is not over yet – check our What’s On pages. If your kids might enjoy a local stay-at-home project, they still have the chance, with a local road safety competition. The local community group is asking kids between 4 and 11 to design a poster which will try to remind motorists to keep within the speed limit when going through our district. When the kids have finished the poster, all they have to do is fold it up and push it into the letterbox in the Kiosk Information Centre (see pic below) in Cresswell lay-by. The posters will then be displayed – with prizes for the best ones. Final entry date is Thursday 1st September. As we all know, most of the parish is covered by a 40mph speed limit, but it’s the sort of law that gets broken as often as it gets observed… sadly… so this competition is a great idea. A lot of people ask us: how popular is this Draycott-in-the-Moors website? Well, we asked the technicians at WordPress (the ‘platform’ that hosts this website) to provide us with the statistics for this website’s performance in 2015, and they have just got back to us with their report. The headlines are: that there were 74 posts (about one every five days) in total; and that pages on the website were viewed on about 38,000 occasions in 2015, by about 14,000 visitors. Of course, many of those ‘visitors’ are the same people coming back time and time and again, but – when you think that there are only nine hundred adults in the Draycott parish area – that’s still pretty good! However, not all the website’s visitors come from Draycott parish. Amazingly, one in twenty visitors were listed as coming from the USA, Australia or Canada. We suspect that these visitors are ‘ex-pats’ keeping an eye on their old home! And visitors liked to comment. There were 150 comments published on the website during last year (and we had double that amount in direct emails from people sending us their ‘private’ thoughts). Anyone can ask for an email alert to be sent to them asking to be notified every time a new article is written; and there are 200 such ‘followers’ at the moment. The most popular page on the site was, not surprisingly, the ‘What’s On’ page with over 1200 views across the year. However, the one single news page on this site to get the most hits was our report in February on the way that Staffs Moorlands Planning Committee approved the Blythe Park application (see ‘Shock Result over Cresswell Planning’). On the day it was published it got a massive 347 views, but it has since gone on to pick up over 600 views so far. But – that is pretty much all the technicians can tell us. There is no way to track which actual individuals visit the website or which UK districts they came from. So, what is our guess about readership? Well, we guess that about half of the population of Draycott/Creswell/Totmonslow regularly access the site. The other questions we get asked are usually about our motivation. We often get asked: who’s behind the website? However, there are also around another twelve local regular people who submit snippets of info and photos. Now and again, someone will write a whole piece; and, if they want to be credited, their name will be on the piece. The fact is however we could do with some new blood; we’ve been doing this three years now, and it’s quite tiring! If you fancy chipping in and doing a bit, email us. What’s the point? Well, it’s not money! This site is done purely as a labour of love. But we also all think like ‘democrats’ – the more a community talks to itself, even about things it disagrees about, the better it will be. Surely, it is good to support the people doing good things, and to ‘nudge’ anyone who forgets that we owe certain duties to our neighbours…? How do we choose things to write about? Well, we don’t really choose in any particular way. Someone just suggests something, or mentions something that’s happened – and it goes on the list, and someone researches it. Or something is suggested in our letters-bag. If you yourself want something mentioned, just drop us an email. It’s very easy. And that’s all it is really. Have a great 2016! Well, any bus-user will be feeling a bit fed up looking at the new bus timetables for our area, which will activate in in a fortnight’s time on September 6th. The changes have been implemented by Staffordshire County Council, who pay for the service to operate. Our district only has one bus service nowadays, which goes through Cresswell, then out to Blythe Bridge & Longton along Uttoxeter Road, and to Stone in the reverse direction. 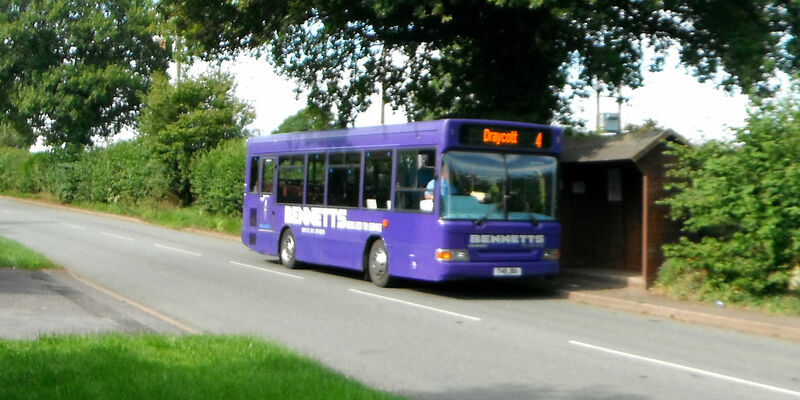 Bennett’s will no longer be running this service through Cresswell-Draycott, which is now taken over by D&G Buses. So, the number 4 bus (Bennett’s) will be replaced by the number 12 (D&G). Bennett’s Number 4 bus – a last sighting? The route is very twisty indeed, going Cresswell – Blythe Bridge – Longton – Stone in a sort of loop. You can get to Barlaston if you want. See the complete new timetable here. You can also see that the number of bus services passing through per day has now dropped from eight (four in each direction) to six. Yes, they have now taken off the last bus, the one that used to run around 4.30pm. There is an bus-information event in Stone on Thursday 3 September at Market Square (near the Co-Op) from 10am-2pm. If you go along, and find out any more, would you let us know? Things are getting so bad for bus-users, that, in neighbouring Fulford, the Parish Council there has helped to start up a voluntary car scheme to enable residents to get about. Slowly, slowly, they are whittling our services down. Soon, we will all need to be getting taxis! There was a nice big attendance for the meeting organised by local action group VVSM last week to discuss the latest set-back for residents over the Blythe Park development. Despite an overwhelming majority of residents in Cresswell expressing opposition to the plan and the fact that it broke Staffordshire Moorlands own Core Strategy, the SMDC planning committee confirmed its decision to approve the plans. Unless VVSM can overturn the result legally (by proving negligence on SMDC’s part) all that remains is for the ‘Section 106’ terms & conditions to be thrashed out… though that could take months. What’s amazing is the Draycott Parish Council’s complete silence over this matter, and over the other local big planning issue, the current housing allocation consultation for Draycott. Most of us expected that the PC would call an emergency meeting, or at least issue some sort of statement to residents … but not a peep. The members can’t all be in Tenerife, can they? Well done to the Draycott Sports Centre tennis team, who have done us all proud by bringing the City & Suburban League Championship title back to Draycott again. The team, ably led by Craig Leese, were trailing Florence for a lot of the season, but achieved a stunning result at the beginning of August, beating Florence 4-0. That result made the way to the championship much easier. The centre is now going to build on its brilliant tennis reputation by setting up a proper ‘tennis committee’ to develop the club’s plans to branch out even more into the community. If that is something that you think you want to give some time to, just contact the club’s Jack Redfern. Incidentally, talking of sport, the last we heard is that Tara Burndred (who is the 4th Dan Black Belt who runs the martial arts centre in Cresswell) is still planning to defend her world title at the Ju-Jitsu International Championships next month in Switzerland. So, stay fit, Tara … and good luck!! Well, after months (and months) of waiting, superfast-broadband is finally here in Blythe Bridge-Draycott-Cresswell. Twelve months ago, we published an article asking what was happening to the roll-out! However, the cabinet in the Cresswell lay-by (see pic, below) now proudly bears its little sticker. 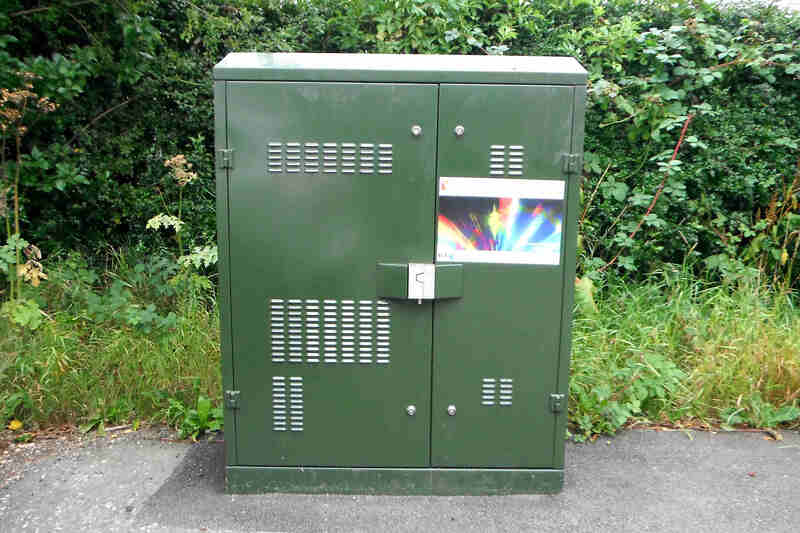 The sticker means the cabinet is now live at last, and – if you upgrade your system – you should be able now to get download-speeds of 80Mbps and upload-speeds of 20Mbps. If you do sign up, let us know if it’s working as well as that for you. Finally, don’t forget to make sure your diaries are up to date with local events. The pick of the crop are the Draycott Sausage & Cider Festival, which takes place this Bank Holiday Monday of course, and then the annual Cloggerfest Free Music Festival, which takes place the following week at Blythe Cricket Club (on September 5th). Cloggerfest has over a dozen acts on stage – including Jimmy Dammage & The Shadow, Gypsy Whores, Quiet The Thief, Baxter, Barrelhouse Jukes, Ryan Doole, Rain, Hornswaggle, Dawn, Rich Clough, Nixon Tate and Venus Rising. And the whole event is free. For parents, there is the good news that weekly Brownies sessions return to Draycott Church Hall in two weeks’ time. But there are loads more events – check out our What’s On page for the details of these and all the other events. One what’s-on notification we got did surprise us though… The Quick-Quick-Slow Dance Studio in Cresswell is advertising a couple of dances that they say will sell out fast – so they are urging us to sign up asap. And when do the dances take place? At Christmas! !